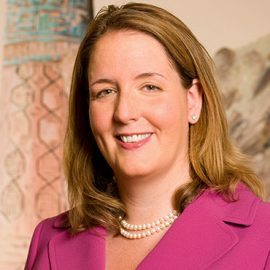 Kate Friedrich is the Vice President of Global Government Affairs for Thomson Reuters, the news and information service. In this position, she is responsible for managing the company’s Washington office as well as assisting in the design and implementation of its strategy in Washington and other key capitals around the world. From November 2003 to March 2010, Friedrich served as special advisor to the undersecretary for democracy and global affairs at the U.S. Department of State. During this time she was also an executive branch staff member to the Congressional-Executive Commission on China, and served concurrently as senior advisor to the special coordinator for Tibetan issues. From November 2002 to January 2009 she also held the position of executive director of the U.S.-Afghan Women’s Council, a presidential initiative designed to mobilize resources to empower Afghan women. In 2008, she was recognized with the Service to America Medal for National Security and International Affairs. Earlier in her career, Friedrich was a program analyst in the Bureau of Population, Refugees and Migration at the State Department, and also served as special assistant to the deputy national security advisor at the National Security Council. Friedrich holds a bachelor of arts in government affairs and politics from the University of Maryland, College Park.